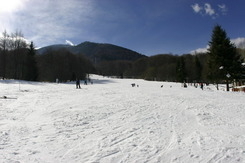 Kulinoto is a site in the northern part of Pirin Mountain, at the valley of “Kulina” river (affluent to Elovica River). It is 1400 meters above the sea level. 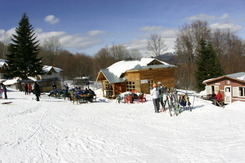 The resort is huddled in venerable beech forest. Kulinoto is 12 kilometers away from Razlog and just 2 from Predela site. 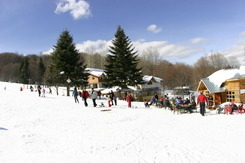 It is locally popular as a place for rest and recreation for the people of Razlog and neighbouring villages. One ski run was made there with the voluntary labour of the local people somewhere in the 1980's. There are two "Pomagalski" type of drag lifts serving the run. There are also a couple of small restaurants. Two grooming machines are maintaining the snow. The place is some 1220 meters above sea level. The highest point of the run is approx. on 1600 meters altitude. 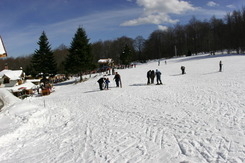 Because the place is not very high the snow usually lasts until mid March. Balkanstroy, one of the most powerful companies in the region have recently signed an agreement with the local municipality of Razlog and have received license to develop Kulinoto into a ski resort. The initial plans will extend the existing ski run, make it longer. Also, there are plans for installing a chair lift. The most ambitious plans are to make new pistes which are starting from the nearby Dautev peak and connecting them with the current ski piste, which is some 900 meters long. There is a very suitable area under Dautev peak, on the southern slope of the mountain where it is possible to make more ski runs. A seat-lift and snow cannons are also included in the plans for development. There will be intermediate pistes with average inclination of 25% and a piste for advanced with 33% inclination. Razlog municipal also plans to realize the project “Old roman road Predel- Bansko”, for reconstruction of the existing road in the region, which will be panoramic and will host a bicycle alley and cultural attractions. Driving on the main road from Sofia to Bansko, after you pass Predel drive slowly and look for the sign Kulinoto. Turn right as the arrow shows.